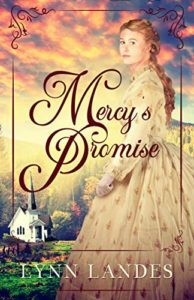 Mercy’s Promise by Lynn Landes is a fabulous Christian historical romance set after the American Civil War. War is a terrible thing – some wounds are visible, some are not. War changes personalities – things that have been seen cannot be ‘unseen.’ Men returned full of anger and pain. In those days, there wasn’t any help. Today we would diagnose PTSD as nightmares reign. Survivor’s guilt is a terrible burden to carry. “ ‘What bothered you most about being a soldier’ ‘Surviving.’ “ God does not want us to live under a burden. He wants us to live abundantly free. “You have to choose between holding onto the past or being thankful for what remains.” The past is gone. We can trust God with our future. No one knows what goes on behind closed doors. There is the difficult theme of domestic abuse. The outward bruises are clearly visible. The inner pain runs deep. Two hurting families come together. This reminds the reader of Esther who was here ‘for such a time as this.’ God can and does use all our circumstances. He can be trusted.